The brush strokes add a nice texture to the painting behind the glass. It is nicely signed on the front by Kouba, 1972. There are two Max Savy artists! Canvas is custom stretched. Shows a boat wreaked on the coast ocean. Proceeds go towards Animal Samaritans rescue and release Feline program. Get Images that. Signed Remington. In very good condition with minimal signs of prior display. Original Watercolor by Phil Austin - "Anchored at Marigot " in St. Martin, W.I. Original watercolor painting by Phil Austin 0n 300# Arches. He is a modest man, even though his paintings hang in galleries around the world and his watercolor technique is studied by aspiring painters everywhere. Delightful Lighthouse at Low Tide. An exquisite example of Washington State artist Tim Wistrom's stylized Seascape work from 1982. Signed & Dated front and verso. Hand painted original oil painting art on canvas Seascape boat signed Ying Man. 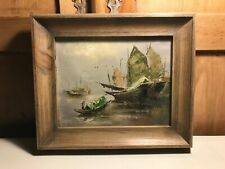 Original Vintage Oil on Canvas Chinese Junk ship Signed by the Artist 10" x 8"
Junks were used as seagoing vessels as early as the 2nd century AD and developed rapidly during the Song dynasty (960–1279). They evolved in the later dynasties, and were used throughout Asia for extensive ocean voyages. Buy It Now at the full price. Overview : OIL ON CANVAS . THIS PAINTING WAS PUBLISHED IN ONE OF THE ARTISTS BOOKS. NOTED ON THE BACK. Outstanding impressionist oil or acrylic on paper of coastal surf on rocks by listed Gloucester and Rockport School artist Dale Ratcliff (20th/21st century). Dale Ratcliff is a well-known, award-winning, plein-air landscape painter from. Judy Hartsfield is a listed and very gifted artist from Alabama. Her favorite subjects when painting were seascapes and still lifes. She passed away, at the age of 87, in 2016. By all accounts she was a gifted, talented artist - who lived a life of grace. Lower right, among boats. Oil on canvas mounted on Masonite. Due to light reflection or shooting angle, there could be minor color different(such as this area is darker or that area is brighter). Condition Ok condition with minor dirt spots. VTG Original Oil Painting On Canvas Framed Seascape Bird Signed Art Fran Hancock Width 34 1/2” Height 28 1/2” This is a beautiful original oil painting Signed by Florida artist Fran Hancock. We need this painting gone ASAP and will accept the first reasonable offer we receive. Carolyn Bearce signed Scituate, MA lighthouse original watercolor painting EC! Carolyn Bearce hand signed original Scituate, MA lighthouse watercolor painting. Local pick up is available. Overview : OIL ON CANVAS. DATES 1970'S. MATERIALS . Under a pink and azure blue sky, ocean waves crash upon a rocky shoreline. Depicted at the center, is a frothy white-capped "pipeline" wave that is realistically rendered with high-lights of translucent chiaroscuro. UP FOR SALE IS THIS ORIGINAL OIL ON BOARD SEAPORT AT SUNSET SCENE PAINTING SIGNED BY ARTIST R.J. NEARY. This painting has great detail with waves and even the sand on the beach. A rare estate find of elegance that will add to any decor. BY ELAINE J HOFFMAN. MINIATURE WATERCOLOR PAINTING. WATERCOLOR DEPICTS COUPLE ON THE BEACH NEAR THE WATER. WATERCOLOR IS SIGNED BY ARTIST. BEAUTIFUL MINIATURE PAINTING! UP FOR SALE THIS ORIGINAL OIL ON BOARD SEASCAPE BIRDS PAINTING SIGNED BY ARTIST BYOD. THE SIZE IS 14" X 20". UP FOR SALE IS THIS ORIGINAL OIL ON CANVAS FLORAL VASE PAINTING SIGNED BY ARTIST CECILIA K. THE SIZE IS 18" X 24". SLIGHT SCUFF WEAR OTHERWISE THE CONDITION IS GREAT. 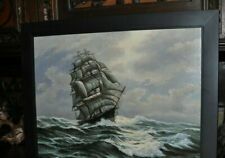 UP FOR SALE IS THIS ORIGINAL OIL ON CANVAS SEASCAPE PAINTING SIGNED BY ARTIST R.FISHER. UP FOR SALE IS THIS PAIR OF ORIGINAL OIL ON PAPER SEASCAPE PAINTING SIGNED BY ARTIST MARSH. TITLED "LA JOLLA". DATED 1975. UP FOR SALE IS THIS SMALL ORIGINAL OIL ON CANVAS TWO RACCOONS INSIDE A TREE PAINTING UNSIGNED. THE IMAGE SIZE IS 8" X 10". We believe this local, Belleville, IL artist was unrecognized and/or underappreciated in larger markets. The bio of Mr. Karasek is on the reverse. Buttercup is our beloved 7 year old black lab. If you happen to find a rogue black lab hair on your item - we promise she is toxic free. Original oil painting on canvas. Very nice oil painting ! Artist: JAMES HUGHES (1929-2010) WATERCOLOR PAINTING 10"x14" Unframed Titled View From Town Landing Waldoboro ME 1974 Signed: Jim Hughes Beautiful vintage original watercolor by Maine Artist Exactly as shown in photos. Outstanding impressionist oil on board of coastal surf on rocks by listed Gloucester and Rockport School artist Dale Ratcliff (20th/21st century). Dale Ratcliff is a well-known, award-winning, plein-air landscape painter from. This is an lovely original nautical painting by JB Reed. A great addition to any coastal lovers collection. UP FOR SALE IS THIS ORIGINAL OIL ON CANVAS SEASCAPE BOATS AT DOCK PAINTING SIGNED BY ARTIST M.A.SNYDER. DATED 1985. Original Vintage Seagull Painting, signed, excellent condition! Original Vintage Seagull Painting, signed, excellent condition!.A perfect compliment to any nautical decor or in any seaside home. Enjoy the peaceful beauty of a gull in flight. This painting leaves you feeling hopeful, adventurous, and optimistic. Painting is on canvas and in excellent condition. Canvas doesn't have any wrinkles or tears. All paint is original and in tact. Signed by artist R. Hunt and titled, "The Gull". Dated 1979. With frame, measures approximately 18.5 x 28. ROCKY NECK, GLOUCESTER, MASS, ARTIST - BERNARD GERSTNER, 1925 - 2017. Bernie's iconic subject matter, the Massachusetts coast, specifically the Gloucester Harbor. Ready for your personal style of framing. For your consideration is an original oil on canvas seascape painting by well-listed Rhode Island artist John Leo Loughlin (1931-2004). I acquired several of John Loughlin's paintings (including this painting) directly from the artist's estate in Lincoln, Rhode Island. UP FOR SALE IS THIS ORIGINAL WATERCOLOR SAIL BOATS ON A DOCK PAINTING SIGNED BY ARTIST D.KUFEL. SLIGHT PAPER TONING OTHERWISE THE CONDITION IS GREAT. 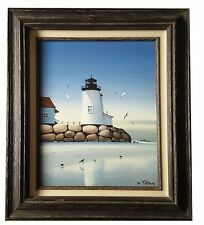 UP FOR SALE IS THIS ORIGINAL OIL ON CANVAS SEASCAPE LIGHTHOUSE ON A ROCK PAINTING SIGNED BY ARTIST PHYLLIS LANDRY PACHECO. THE SIZE IS 24"1/2 X 30"1/2. UP FOR SALE IS THIS ORIGINAL OIL ON CANVAS SEASCAPE BOATS AT DOCK PAINTING SIGNED BY ARTIST DILLON. THE SIZE IS 28" X 32". HERE IS A BEAUTIFUL ORIGINAL WATERCOLOR PAINTING SIGNED BY PHIL THOMASSON, 1982. IT IS OF A SWAMP SCENE WITH A MAN PADDLING A PIROQUE IN THE FOG. FREE Trial! A large oil painting on canvas of a lake landscape. No signature found. Available to US mainland only. Original Wayne Wu. See pictures for details on condition. International Patrons.